Recent survey data suggest that most Americans are optimistic about their chances of achieving a comfortable and financially secure retirement. For example, a report from State Street Global Advisors (SSGA) found that 52 percent of surveyed U.S. adults said that they are “extremely” or “very” confident that they will be able to meet their retirement goals. Similarly, the latest DC Pulse survey from BlackRock found that 56 percent of participants in 401(k)s and other defined contribution plans believe that they are “on track” to retire with the lifestyle they want, and almost seven in 10 respondents said that they expect to be able to save enough to meet their financial goals in retirement. Despite the overall positive sentiment, many financial experts worry that Americans are at risk of overestimating their level of retirement readiness. Performance in the stock market, for instance, has been very strong recently, and it could therefore be a mistake for people to assume that such outsized returns will continue forever. In fact, the BlackRock study found that surveyed DC plan participants’ expectations for investment returns over the next decade are roughly double the financial industry’s forecasts, and nearly two-thirds of workers said that they are unaware of professionals’ lower performance outlook. When presented with the industry’s forecasts, 39 percent of DC plan participants indicated that they feel “very or extremely” concerned, and only a third said that they believe they are taking an appropriate level of risk to meet retirement goals. 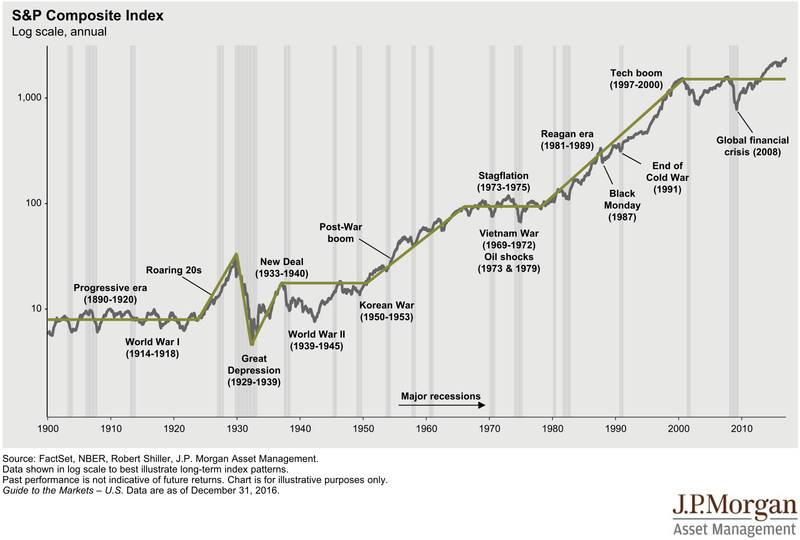 Of course lower returns do not necessarily mean no returns, and the long-term resiliency of the stock market is undeniable. A changing return environment, though, could mean that in order to accumulate the same amount of money that participants built in previous years by contributing 6 percent of their earnings, workers may need to contribute double or even triple that amount going forward, according to Anne Ackerley, head of BlackRock’s U.S. and Canada defined contribution group. All of this highlights the importance of regularly consulting with a professional financial advisor because even if investment returns do remain at this elevated level, planning for retirement can still be quite challenging. For example, there are a handful of potential old-age financial setbacks that too many people fail to account for when estimating how much money they should save for retirement. 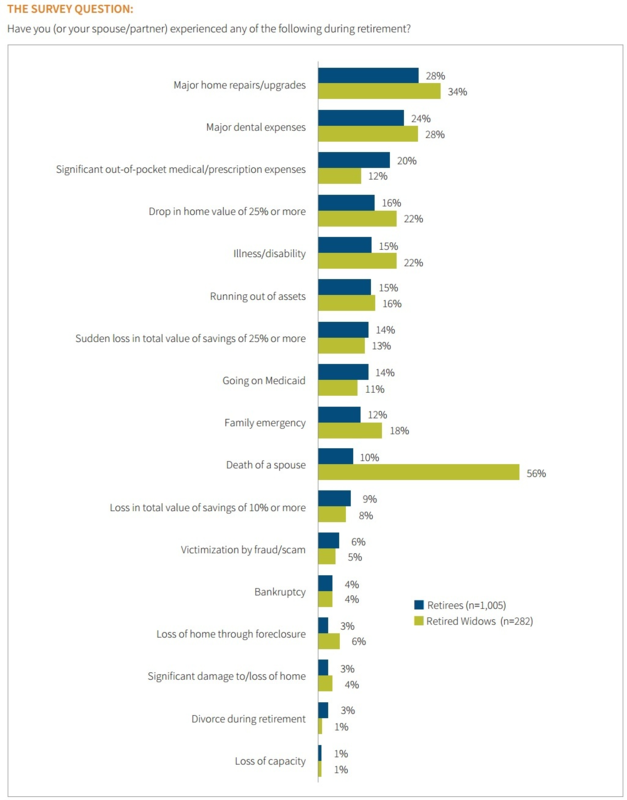 Just look at the analysis by the Society of Actuaries which found that roughly one in five (19 percent) surveyed retirees said that they had already experienced four or more financial shocks during retirement, with major home repairs and dental care being the most common unexpected expenses. 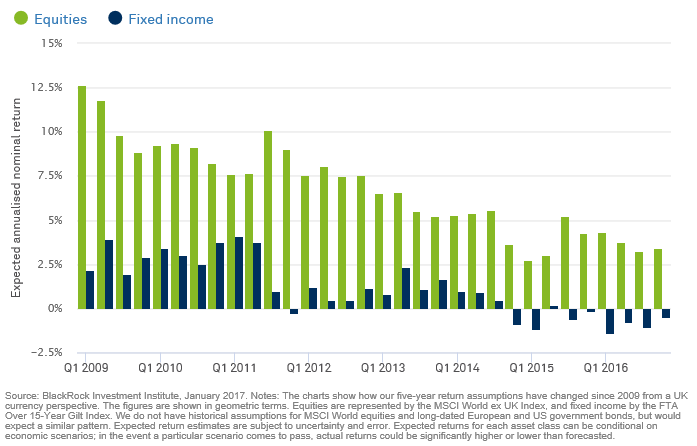 Such monetary setbacks can be substantial, and many respondents said that their asset levels were severely depleted by the shocks they encountered. In fact, 22 percent of the retirees who said they experienced a reduction said that it resulted in a loss of 50 percent or more in their total retirement assets. One survey respondent, for instance, reported that “We had maybe $60,000 or $70,000 in Fidelity, and we had maybe $10,000 in a savings account that was going to be fun money for us. 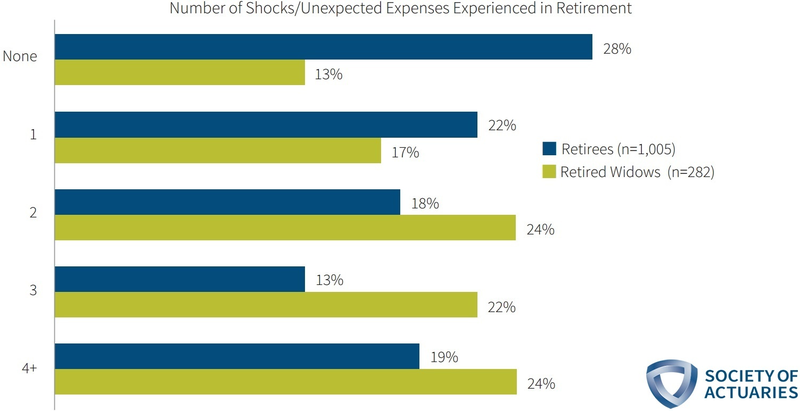 We had to spend all that.” Only 28 percent of surveyed retirees said that they had not yet experienced any financial shocks.